Place dough on work surface. Flatten loaf of dough to 18 inches long and 2 inches thick. Cut in half lengthwise. Make 8 crosswise cuts to make 16 buns. Place on cookie sheet. Bake 17 to 20 minutes or until golden brown. Remove to cooling rack; cool 10 minutes. Meanwhile, in 8-inch nonstick skillet, cook bacon over medium-high heat 3 to 5 minutes or until crisp, stirring occasionally. Drain on paper towel. In small bowl, mix bacon, mayonnaise and blue cheese. Cut each mini loaf in half horizontally to within 1/4 inch of other side; open each loaf to lie flat. Spread about 1 teaspoon mayonnaise mixture on bottom half of each roll. Spread about 1/2 teaspoon preserves on top half of each roll. 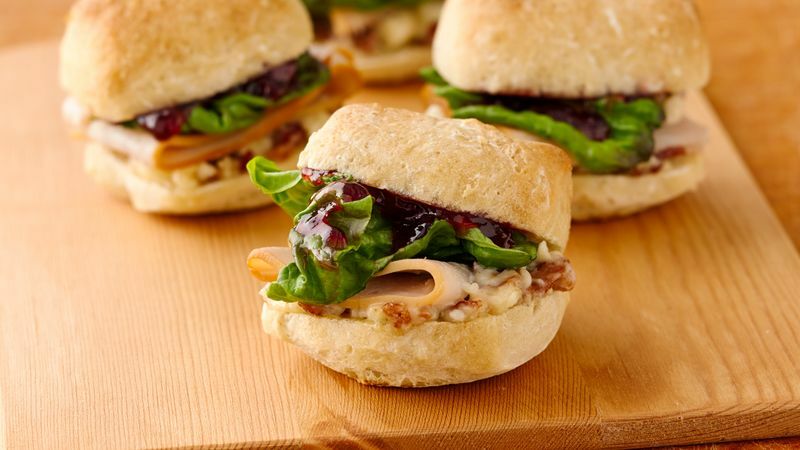 Fill each sandwich with 1/8 of the turkey slices and 1 lettuce leaf. Fold tops over lettuce.